Would anyone think that any of the future hair loss treatments/cures may help with someone suffering from Alopecia Universalis? » help with someone suffering from Alopecia Universalis? Hard to say, really. Since we don’t know the exact etiology of alopecia universalis (or any of the supposed autoimmune alopecias), it’s hard to come up with a proper cure. You would think that HM, should it ever be developed, wouldn’t be 100% effective in these patients, due to the susceptibility of these follicles to the same underlying pathological mechanisms. » » help with someone suffering from Alopecia Universalis? Yeh, I suppose you’re right. My buddy’s little brother doesn’t have a single strand of hair on his entire body, from head to toe. We think we have it bad, you should see this poor kid. » » » help with someone suffering from Alopecia Universalis? » have it bad, you should see this poor kid. There are a couple of topicals which are showing promise in this area.Also people with such conditions tend to have a maladaptive stress response. Elias has spent many years refining his ideas into a topical for AA. » » » » help with someone suffering from Alopecia Universalis? » » have it bad, you should see this poor kid. » people with such conditions tend to have a maladaptive stress response. » Elias has spent many years refining his ideas into a topical for AA. Hey Pete, some more info would be great. » » » » » help with someone suffering from Alopecia Universalis? » » » » mechanisms. » » » have it bad, you should see this poor kid. » » people with such conditions tend to have a maladaptive stress response. » » Elias has spent many years refining his ideas into a topical for AA. » Hey Pete, some more info would be great. 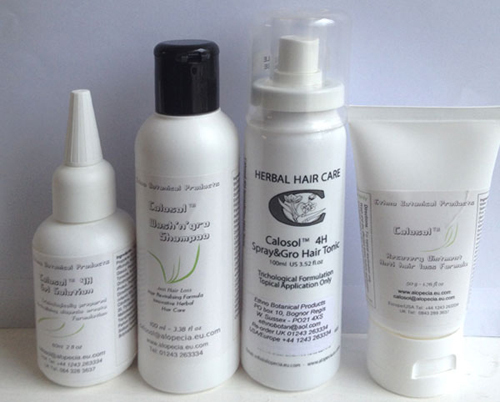 The Calosol 4H product is designed by Alopecians for Alopecians is recommended for Women, Men or Children Alopecia Areata is a reversible type of hair loss.